President Trump put his worldview on display before meeting with G-20 leaders last week, said Peter Beinart in TheAtlantic.com, and it’s dripping with “racial and religious paranoia.” On a side trip to Warsaw, Poland, Trump delivered an alarming defense of “Western civilization” of a kind never heard from a U.S. president. 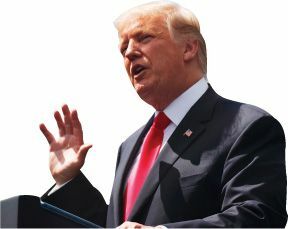 He spoke not as the elected leader of a multicultural, heterogeneous nation, but “as the head of a tribe.” In a thinly veiled reference to the Islamic world and to other nonwhite, non-Christian nations, Trump warned of forces “from the South or the East, that threaten…to erase the bonds of culture, faith, and tradition that make us who we are.” In the speech’s “most shocking sentence,” the president said that “the fundamental question of our time is whether the West has the will to survive.” This only makes sense if you see “nonwhite, non-Christian immigrants as invaders” and an existential threat. Tellingly, Trump’s defense of “Western values” contained no mention of human rights and just one reference to democracy, said Jeet Heer in NewRepublic.com. It was also no accident that he chose to expound on “white-grievance politics” in Poland, whose rightwing ruling party is strongly nationalistic and anti-immigrant and has aggressively sought to curb the independence of the country’s judiciary and media.